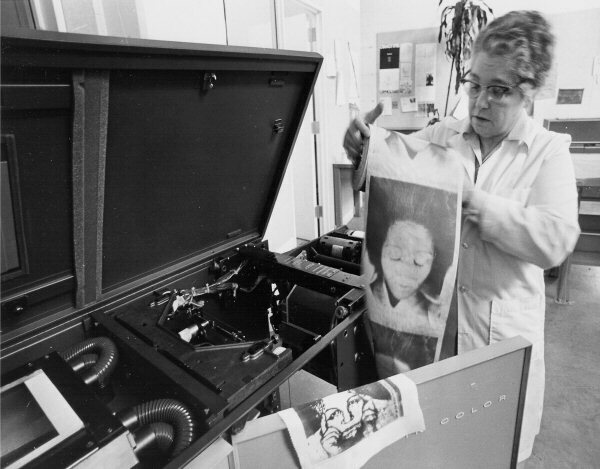 [Sonia Sheridan manipulating the "C-in-C" copier in "Generative Systems" classroom], 1978, 1 photographic print, b/w ; 8 X 10 cm. The Daniel Langlois Foundation for Art, Science and Technology, Sonia Landy Sheridan fonds. Sonia Sheridan manipulating the "C-in-C" copier in "Generative Systems" classroom, 1978, 1 photographic print, b & w ; 8 X 10 cm. Photographer unknown. The Daniel Langlois Foundation for Art, Science and Technology, Sonia Landy Sheridan fonds. 0501-1. [Sonia Sheridan manipulating the "C-in-C" copier], 1978. 1 photographic print, b & w ; 8 X 10 cm. Photographer unknown. The Daniel Langlois Foundation for Art, Science and Technology. Sonia Landy Sheridan fonds. 0501-1. Still from Portrait of Sonia, shot and edited by par John Mabey, 1977, video (24 min. ): copy, colour, sound, U-Matic. The Daniel Langlois Foundation for Art, Science, and Technology, Sonia Landy Sheridan fonds. The intermediate roll with stripes of Mylar film saturated with coloured powders. The Daniel Langlois Foundation for Art, Science, and Technology, Sonia Landy Sheridan fonds. In the mid 1950s, Joseph Wiese of 3M explored the possibility of transferring coloured pigments to a sheet of paper according to the principle of thermography. In the meantime, his colleague Douglas Dybvig was conducting research in the 3M Copy Products Division laboratory. At the end of the 1960s, together with Don Conlin, Dybvig implemented a team of researchers to design the first model of the colour photocopier. Assisted by chemist Thomas Evensen, Dybvig began by determining the composition of the pigments and paper, and John Ulseth then designed the electromechanical components. In 1968, 3M officially announced it would market the first model of the C-in-C to the company’s shareholders. Initially designed for office use (the production of diagrams, acetates, etc. ), the photocopier would be used primarily by artists in the first half of the 1970s. For example, Sonia Landy Sheridan (then professor at the Art Institute of Chicago) began exploring the graphic possibilities of the C-in-C during a residency at 3M in 1970. 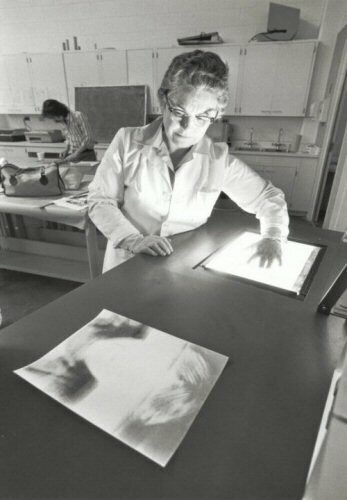 The exhibition Software, organised during the same year by Jack Burnham at the Jewish Museum (New York, NY, U.S.), allowed Sheridan to introduce the photocopier to the general public (she collaborated on this initiative with Conlin and Dybvig). Following the exhibition, Sheridan convinced the Art Institute to rent and eventually acquire a C-in-C on an instalment payment plan. The tool would become a vital component of the Generative Systems course until 1972 (at which time 3M took the photocopier back). During the 1970s, Dybvig and the team in 3M’s Color Research Department continued their research efforts in order to improve the quality of the image reproduction and add colours to the spectrum of the first C-in-C. 3M then launched the second model under the name Color-in-Color II (please see operating procedure below). However, due to a lack of demand from business customers who, in the 1950s, had bought the first black and white photocopiers en masse (the Haloid and 914 by Xerox), 3M abandoned production of both C-in-C models towards the end of the 1970s. Two electromechanical and electronic component boxes (the first was comprised of the lenses and exposure lamp, the second of the infrared lamp, printing drums, guides for the intermediate roll, and the secondary control panel); peripheral control module. Printing materials: intermediate roll; silver oxide powder cartridge for the intermediate; printing paper (receptor). The Color-in-Color I photocopier allowed colour copies to be generated while reproducing the chromatic scale of the original. 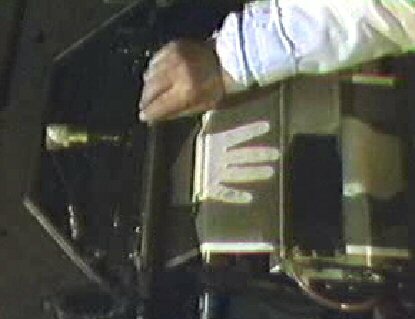 Its external module featured a transparent glass surface measuring 20 cm by 30 cm (on which one would place the item to be copied), a cover to block the light during the sweeping process, and a console in a peripheral module (e). In addition to the start button, this console included knobs and buttons used to adjust the three colour cycle (please see below), grey scale, contrast, and number of copies desired for a given image (f). When the start button was pushed, the photocopier’s lamp would flash on the source three times (this operation lasted approximately 30 seconds). During this sweeping process, the reflected light would pass in succession through three lenses or filters (blue, yellow and red) corresponding to the three exposure cycles. Like chromogenic printing or photography, the C-in-C generated images according to the subtractive colour synthesis theory. A proportional mix of yellow and magenta would produce the red scale; a proportional mix of yellow and cyan would produce the green scale; and a proportional mix of magenta and cyan would produce the blue scale. The achromatic white colour would compensate for value differentials. Mixing all of the colours would produce black (n). Unlike printing techniques that used ink or silver formulas, the C-in-C chromatic principle was based on powders that produced a chemical reaction to heat. Also, an intermediary black and white process was needed to produce the grey scale of the source. The C-in-C’s interior components therefore included a roll of paper (known as the intermediate) (g) coated with a photosensitive base of zinc oxide. While the light sweeping the item placed on the photocopier’s glass panel went through the three cycles described above, it simultaneously passed through another lens to adjust the grey scale and contrast. Silver oxide powder was dispersed on the intermediate, and the particles adhered through magnetism to the zones receiving little light while being repelled from exposed zones. To generate colour superimposition, the back of the intermediate contained stripes of Mylar film saturated with coloured powders (h). Through a system of motorized drums and guides, three of the intermediate’s colour zones (yellow, magenta and cyan) passed successively over the receptor – either a sheet of paper or another treated support that would receive the image. An infrared light or fuser (i) emitted the heat required to disperse the powders across this surface according to the black and white image’s grey values. The clear zones would heat up, impregnating the powder on the receptor, while the dark zones blocked the heat (blocking the powder in the meantime). 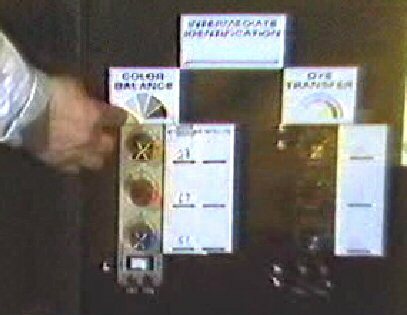 In the internal component of the C-in-C, knobs and buttons allowed the paper’s exposure to the powder to be more easily modulated as the intermediate passed through the machine. 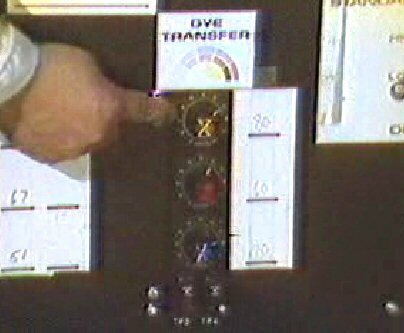 Behind the right-hand door of the photocopier were nine control knobs (j). The first row of these regulated the grey scale of each of the three colours by calibrating the amount of silver oxide dispersed on the intermediate (k). 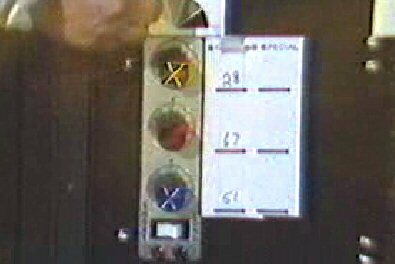 The knobs operated in a similar fashion to the console’s corresponding knob, but they regulated just one colour at a time. A second row of knobs balanced the degree of saturation of the colours at the moment they were transferred to the receptor (l). And a final row of knobs set the development voltage (to more precisely define contrasts and outlines). Other buttons changed the length of time and the way the source would be swept with light. 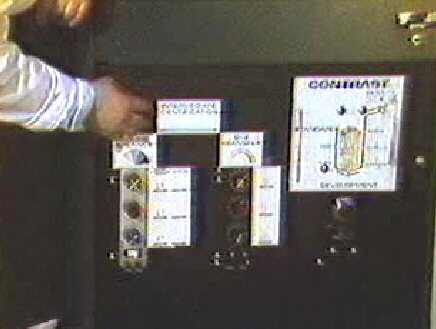 3M designed this control panel in order to periodically calibrate the chromatic scale of the C-in-C, but artists such as Sonia Sheridan also used it to produce graphic effects. 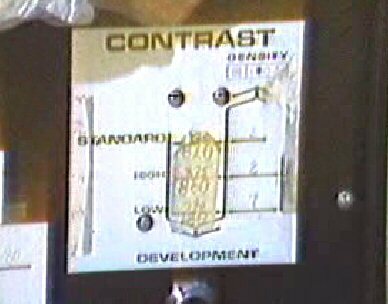 Unlike the first C-in-C model, which was limited to a 1 = 1 reproduction of the original, one of the advantages of the Color-in-Color II was its ability to print large format copies of 35 mm slides. Colour copies that reproduced the chromatic scale of the original document.